In 2018, OSHA cited at least 4,552 hazard communication violations (final figures for the year are still forthcoming.) This is second only to fall protection violations and has been for the last four years. 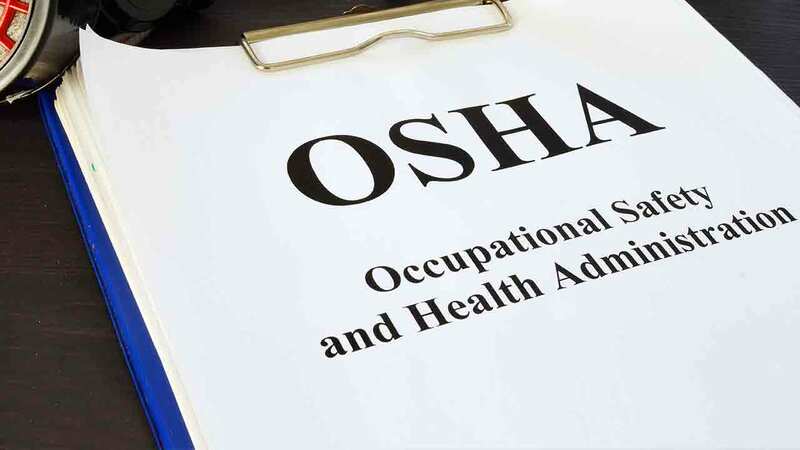 Companies need to examine their compliance in this often-overlooked category in order to avoid OSHA fines, protect their workers, and maintain their image of professionalism. Asbestos: Although it’s been a long time since any new asbestos was installed, older buildings may still contain traces of asbestos in rooftop insulation—it’s present in nearly every building constructed before the 1980s. Asbestos causes lung damage and lung cancer. Lead: Just as with asbestos, many buildings built before 1980 were given several coats of lead paint. This paint can flake off when disturbed, forming an inhalation hazard. Damage to the organs and nervous system can be the result. Silica: Industrial and commercial roofs are often lined with gravel. Any gravel mixture can contain sand or silica, which when inhaled causes a condition known as silicosis. This takes the form of a persistent cough or shortness of breath. Over the long term, silica exposure can even cause cancer or organ damage. In addition to environmental hazards, many of the tools used in roofing, such as sealants and adhesives, may also contain hazardous chemicals. There are three main components to any HazCom plan: documentation, training, and labeling. Documentation comes in the form of a safety data sheet (SDS). This is usually available from the manufacturer of any substance containing a hazardous chemical. Among other things, the SDS will detail whether a material is toxic, the dosage required for toxicity, the treatment for exposure, and the kinds of personal protective equipment (PPE) required to handle the material safety. It will also detail other emergency preparation procedures, such as what to do if the material catches on fire. Training means taking the advice from the documentation and putting it into practice. Employees should know—without referring to the SDS—what hazardous materials are on site, where they’re stored, and how to use them safely. They should also be trained in accident prevention and preparedness, including how to use their protective gear. In addition, the employer must have a comprehensive plan to limit employees’ exposure to potentially hazardous substances. Lastly, labeling means making sure that employees can easily identify containers and areas that hold hazardous materials. Labels for hazardous materials must be easily identifiable—including the name of the material, a pictogram consisting of a black picture on a white diamond background outlined in red, the word “danger” in both English and Spanish, and a list detailing why the material itself is hazardous. In our example, a roofing company is working on a rooftop contaminated by asbestos. Asbestos removal is an interesting case, with some exceptions to the general rules about hazardous communications. On the documentation side, it is actually not necessary to provide an SDS—these are usually obtained from the chemical manufacturer, and one could hardly expect to obtain an SDS from a manufacturer of asbestos that might be decades out of business. OSHA does, however, encourage companies to provide a generic, non-manufacturer-specific SDS for asbestos-contaminated environments. To aid with training their employees, OSHA creates a generic SDS for asbestos and instructs them on safety procedures—namely, employees must wear protective gear, avoid smoking, eating, or drinking in contaminated areas, and practice decontamination before breaking for lunch or leaving the job site. In addition, the company trains supervisors to ensure that no employees remain inside an asbestos-contaminated area beyond their recommended exposure limits. Lastly, asbestos-contaminated areas are labeled to ensure that no employees enter them without proper protective gear. When roofing contractors properly obey OSHA rules on hazard communications, they do more than just avoid fines. They help protect their workers and their reputations for safety and professionalism—making themselves easier to work for and making it easier to win contracts in turn.